For the first time in its 20 year history the final of the World Corporate Golf Challenge Tournament will be played in Scotland on the Carrick Golf Course on the banks of Loch Lomond in May 2013. This course was named after its designer, Doug Carrick. 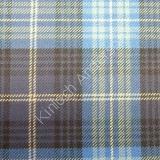 The surname 'Carrick' is associated with the Clan Kennedy and the Clan Kennedy tartan was the starting point of this new design. The colours of the tartan are a tonal mix of blues and greys which reflect the corporate colours of the Tournament’s logo and a fine white line passes through Saltire blue to represent the Scottish flag. The tartan will be worn by many from around the world who come to the event in May 2013.